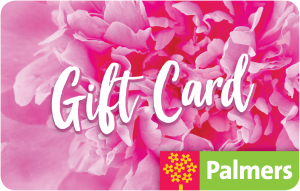 Palmers Garden Centre Gift Cards | The Perfect Gift for Mum? Palmers Gift Cards, the perfect gift! Gift shopping made easy, the ‘pick your own present’ solution. Gift cards can be purchased and redeemed at all Palmers stores (North Island only). Choose your own value. Gift cards can be sent directly to your special someone.